Bowser has stolen the Vibe Wand and escape to Vibe Island. 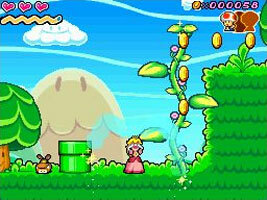 Mario & Luigi get captured, so Peach teams up with Perry the Parasol and sets off to rescue her friends. Peach must traverse each stage, taking out enemies and solving puzzles. The island's vibes increase the power of her emotions, giving her special powers when her Vibe Meter is full. Delight lets her spin and float on air; Anger gives her fiery strength; Sadness makes her cry and run around quickly, and Happiness refills her health. Each world has five stages and a boss battle to complete. There are also three Toads hidden in secret areas of each stage to find. Hidden on three stages is a starfish-shaped enemy that has to be defeated all three areas to add him to your enemy gallery. Supposedly the prince of a faraway kingdom, Starfish is actually based on Starfy from the Legendary Starfy series. He is wearing sunglasses, but is otherwise identical.